Republicans and Democrats have sharply different views about America’s role in the world and on some key questions — such as whether the U.S. is more or less respected than in the past — their opinions depend on whether their party controls the White House, according to a new Pew Research Center survey released this week. About three-quarters (74%) of Republicans surveyed in November said the U.S. now plays a less important and powerful role as a world leader than 10 years ago —more than the overall public (53%) and far more than Democrats (33%). 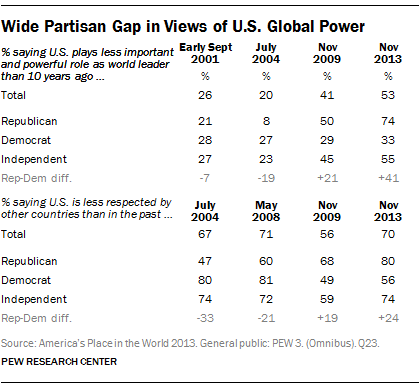 The partisan gap on whether the U.S. is less respected in the world than in the past is smaller than the gap on the question about the U.S. as a world leader: Eight-in-ten Republicans hold that view compared to 56% of Democrats. But the survey shows a big shift in sentiment among Republicans and Democrats over the years depending on whose party held the White House. While Republicans now see the U.S. as less respected (during the Obama administration) than do Democrats by an 80% to 56% margin, those numbers were almost exactly the reverse in a May 2008 survey, near the end of the Bush Administration. In May 2008, 81% of Democrats said the U.S. was less respected compared to 60% of Republicans. And, toward the end of George Bush’s first term in July 2004, 80% of Democrats believed the U.S. was less respected compared to 47% of Republicans. When it comes to America’s role in the world, there is one prominent area where partisan differences are relatively small. About half (51%) the overall public believed the U.S. does too much in terms of helping solve world problems compared with 17% who think it does too little and 28% say it does about the right amount. 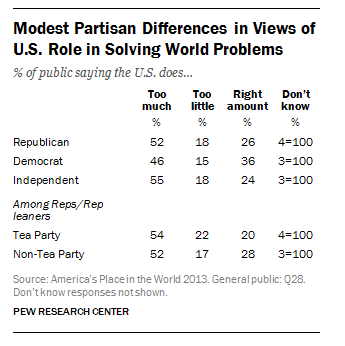 The view that America does too much is shared by 52% of Republicans and 46% of Democrats. Similar numbers of Republicans (18%) and Democrats (15%) say the U.S. does too little while 26% of Republicans and 36% of Democrats consider U.S. involvement abroad is the right amount. But significant partisan gaps re-appear when Americans are asked to rate their top long-range foreign policy priorities. The biggest gap is over dealing with global climate change, reflecting a divide that also shows itself in polls about global warming as a domestic issue. 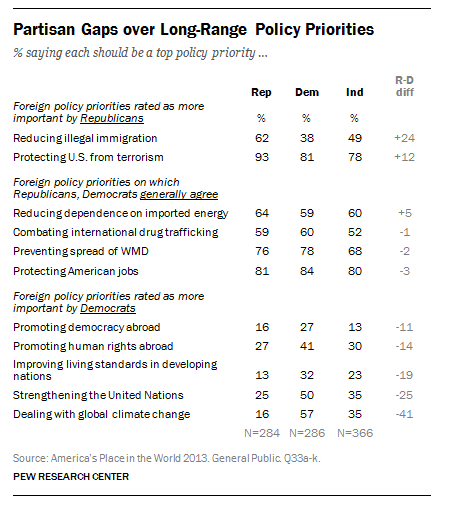 Nearly six-in-ten (57%) of Democrats called dealing with global climate change a top long-range policy priority compared to 16% of Republicans — a 41 point gap. On priorities important to them, Democrats also favor strengthening the United Nations by 25 points more than Republicans and back efforts to improve living standards in developing countries by 19 points more. When it comes to issues most important to Republicans, their biggest gap with Democrats is over the priority to put on reducing illegal immigration. The share of Republicans considering that a priority is 24 points higher than that of Democrats.